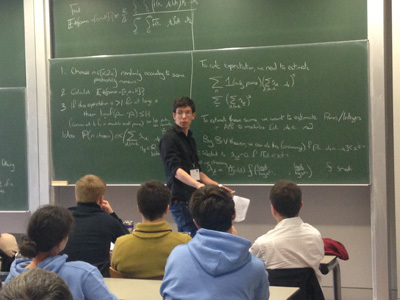 When James Maynard gave his talk at the British (Applied) Mathematics Colloquium last week, there was a distinct air of expectation in the room — and no seats left as so many mathematicians had squeezed in to see him. The reason was two-fold: not only has Maynard made significant progress in one of the biggest open problems in maths, but also is this problem really easy to understand, even if you are not a mathematician. This is a rare thing in maths where the mere statement of a question is often impenetrable for people who aren't experts in the field. James Maynard in Cambridge last week. The problem Maynard was talking about is the twin prime conjecture, which we have often mentioned on Plus. The prime numbers are those whole numbers that aren't divisible by any other number apart from 1 and themselves. The number 2 is (by convention) the first prime, followed by 3, then 5, 7, 11, 13, etc. We know that there are infinitely many prime numbers, but they aren't distributed evenly. There are twenty-five primes within the first hundred whole numbers, but only two in the hundred numbers after 10 million (they are 10,000,019 and 10,000,079). In fact, we know that the primes tend to get sparser and sparser as you move up the number line. But they don't thin out in a uniform way. Every now and again you hit a pair of primes that are only two apart. The first examples are 3 and 5 and 5 and 7, but there are also larger pairs, such as 137 and 139, or 3,756,801,695,685 x 2666669-1 and 3,756,801,695,685 x 2666669+1 (the latter two numbers have 200,700 decimal digits each). No matter how far you go up the number line, you always seem to hit upon another pair of twin primes eventually. And this is what the twin prime conjecture suggests: that there are infinitely many pairs of twin primes. Prime numbers have fascinated people for millennia, partly because they are the building blocks of all the other whole numbers. If a number is not a prime, then you can factorise it; for example, 30 = 2 x 15. If one or both of these factors isn't itself a prime, then you can factorise further, eg 30 = 2 x 3 x 5. Continuing like this, you can see that every whole number can be written as a product of primes (2, 3 and 5 in our example). And as the mathematician Euclid showed over 2000 years ago, this factorisation is unique: there is only one way in which a number can be decomposed into prime factors. "The reason I really like prime numbers, and number theory in general, is that quite often there are these very simple problems that almost anyone can understand, but that have been unsolved for thousands and thousands of years," says Maynard. The twin prime conjecture is a good example — anyone playing around with primes will soon suspect that twin primes come up again and again, but a proof has so far eluded mathematicians. It's only in the last few years that significant progress has been made. 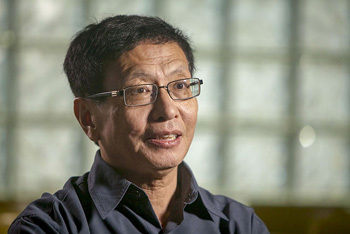 The first breakthrough came in 2013, when the relatively unknown mathematician Yitang Zhang proved that there are infinitely many pairs of primes that are at most 70 million apart. "On the face of it this seems like a very poor result, which is miles away from the twin prime conjecture [for which we'd need a gap of 2 rather than 70 million]," says Maynard. "However, before Zhang's result we didn't even know if there was any number at all, whether it was 70 million, or 70 billion, or 70 trillion, such that there were infinitely many pairs of primes that differ by this number. So we went down from infinity to 70 million, which, to a mathematician at least, is an absolutely huge breakthrough." Yitang Zhang, who delivered the first of recent breakthroughs. Image: John D. and Catherine T. MacArthur Foundation. Zhang's result caught the attention of Terence Tao, one of the world's best mathematicians, who decided to make it subject to an exciting new way of doing maths. "Over the last few years there have been trials of [so-called] polymath projects where groups of mathematicians get together online and through blogs and wikis share mathematical ideas and try to prove results together," says Maynard. "After Zhang's breakthrough one of these polymath projects was set up to try and bring the size [of small gaps between primes] down to the smallest possible. The project was open to absolutely anyone, mathematician or non-mathematician, whoever wanted to get involved." Maynard joined the flurry of activity, introducing a new technique for proving things about gaps between primes and eventually joining polymath (see here). "This is quite strange for me in that I'm quite a stereotypical mathematician: I tend to work on my own or in small collaborations with one or two other people," he says. But the effort paid off: thanks to Maynard and his polymath friends we now know for certain that there are infinitely many pairs of primes that differ by at most 246. This new world record is a significant improvement on 70 million, but the polymath project has also shown that you can do even better — if you make a particular assumption about patterns within the primes. "We know that there are roughly the same number of primes with, say, a million digits that end in the number 1, as there are ending in the numbers 3, 7 or 9," explains Maynard. "A rather more technical version of this statement, called the generalised Elliot-Halberstram conjecture (GEH), says that there are roughly the same number of primes in lots of other arithmetic patterns." The GEH conjecture (we won't spell it out here) has not yet been proven, but people strongly believe that it is true. And if you assume that indeed it is, then you can prove that there are infinitely many pairs of primes that are only 6 apart. and so on. But no one has so far been able to prove that it holds for all even numbers greater than 2. "If you believe the GEH conjecture is true, which all mathematicians do, then you can prove that at least one [and possibly both] of the twin prime conjecture and a slightly weaker version of the Goldbach conjecture is true," says Maynard. That weaker version states that every even number that is sufficiently large, if it isn't itself a sum of two primes, is only two away from a number that is. So a lot hinges on the GEH conjecture: not only does it give you a gap of at most six, it also gets you within a hair's breadth of at least one of two famous problems in number theory. Are there really infinitely many twins? All this sounds promising as far as the twin prime conjecture is concerned — if you can get a gap of six (subject to GEH) then surely you can manage two? Unfortunately it turns out that six is where current mathematical tools, sophisticated though they are, appear to hit a wall. "If you believe certain things mathematicians strongly believe are true, then you can also show that this whole approach we have to prove the existence of small gaps between primes can't be extended any further than the result of six. So we need to come up with some other big new idea if we want to prove the twin prime conjecture." This raises an obvious question: if the twin prime conjecture resists proof so vehemently, then perhaps that's because it isn't actually true. Perhaps you do eventually run out of twin primes as you move up the number line. "Mathematicians are very confident that the twin prime conjecture is true," says Maynard. "You can do numerical tests for counting how many twin primes there are, and you can use mathematical guessing techniques to count the number of primes below, say, one million, or two million, or three million, and then compare the two. It turns out that the guesses match up exceptionally well with the numerical evidence. So we feel that we have very strong heuristic arguments and numerical evidence for the twin prime conjecture being true. But from a mathematician's point of view the result is certainly far from proven. There have been mathematical problems in the past where people thought one thing was true because it fitted well with numerical evidence, but it turned out that actually the opposite was true." We won't know for certain until someone finally settles the conjecture one way or the other — given the recent progress, can we hope for this to happen within our life times? "I remember hearing once that if you are asked to make a guess as to how long it will be until a conjecture is solved, the most sensible thing to guess is the length of time it has already been around," says Maynard. "But unfortunately there is quite a lot of argument about how long the twin prime conjecture has been open for. Some people say a hundred years, some say several thousand years. So I'm afraid I have no idea at all when the twin prime conjecture will be proved."